Hello and Welcome! Thank you for joining me! I’m so very honored to be a part of Debbie’s home tours. I’m Sonya from Beyond the Screen Door, an interior designer, wife and mother of 4. My husband and I, along with our three youngest kiddos (ranging from 15 to 24) live in Oklahoma. My oldest daughter and her husband live in California. We removed most of the wall separating the kitchen from the living room. Though I lost quite a bit of upper cabinet storage, I haven’t regretted this decision one bit. A view of the updated mantle. We built our home and have lived here 7 years. I love the openness created by removing the wall. Even if the reality is the sink is almost always full of dishes, I still love it. Here you see a glimpse of the brick arches that form two walls of our dining room. The old sofa once belonged to my oldest daughter but when she couldn’t get it to California (how sad) I laid claim to it. It now offers much needed extra seating in the dining room. Can you tell I like pillows? Debbie, THANK YOU so much, for inviting me to be a part of your home tours! Thank you Sonya for having us over today. Have I ever told you how much I love your front door? Well, yes, I do…LOVE the color! Hop on over and say hello to Sonya if you don’t know her already. She does the most fabulous custom window treatments. and runners…pretty much any fabric job you are looking for. I LOVE everything about Sonya’s beautiful home!! Great tour Debbie! Cozy home and her front door is what made me paint ours a couple years ago. Sonya has a beautiful home! Definitely decorated in a way that I would be very comfortalbe in myself. Love all her window treatments and pillows. I’m glad to see she makes some of these beautiful things for her own home, too. Thanks for sharing Sonya’s home with us, Debbie! What a luvly home. Thank you Sonya for allowing us in to peek… Thank you Debbie for making it so. 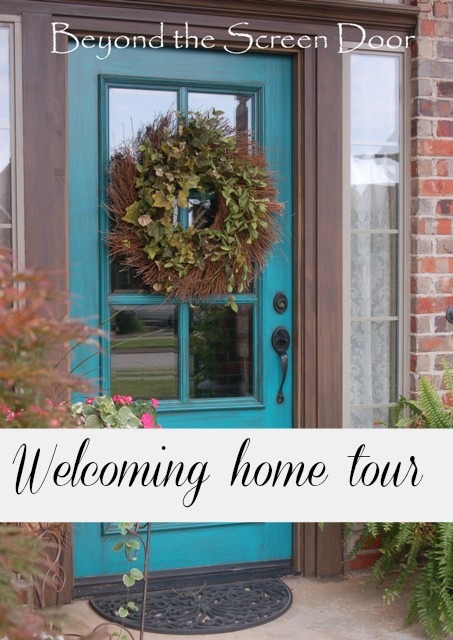 What a beautiful home tour!! I love the floor… addicted to floors that have that black and white look!! Love it!! Sonya has a gorgeous home, it is so welcoming and comfortable. I love all of her widow treatments, she picks out the best fabrics. So, so gorgeous! I love her wonderful kitchen and all of the pretty window treatments! Sonya’s home is gorgeous. So homey. Enjoyed this lovely home hour. Thanks for sharing. Sonya, your home is is gorgeus…love every inch of your home and I was the proud recipient of one of your beautiful burlap tree skirts….you do gorgeous work! !…Love that you removed the wall, as your kitchen is so beautiful….Thanks Debbie for presenting Sonya’s beautiful home….Have a wonderful weekend Debbie and Sonya! Love the openess of Sonya’s home and that kitchen is fabulous. Thanks for featuring it Debbie and Sonya. Thanks so much Sonia and Debbie! Sonia…your home is so warm and cozy…I love all of the texture and the kitchen/living room space was a great decision , we did the same thing. Love your cabinets and the stove top area. You master bedroom is lovely, too. Oh, and the door…love it!! Thanks again, Debbie for the invitation to join your home tour. And for everyone’s sweet comments! What a blessing! Wow Sonia has a great home. I love her kitchen. Wow it is gorgeous. Loved this tour of her home. I look forward to you tours and this one is beautiful! Debbie great tour. I too, love that front door and her entire home is beautiful. Thanks for the peek. Sonya’s home is wonderful! It looks inviting and comfortable! Even though she said it was built just 7 years ago, it has the charm of an older home…yet with the updated look in the kitchen…I love it! Gorgeous! And yes, I LOVE the front door too. I also love all the window treatments and pillows. What a feast for the eyes! I love her use of colors and textiles so much! It’s just beautiful to me!!!!! Hi! I found your blog from Pinterest and I know this is an older post, but I have to ask where you got your bedding/quilt? I saw your shop for pillows and I’d like to purchase some, but I also want this bedding! Can you pretty please share where it is from? Or if it is something you made yourself can you do a special order and let me purchase one? I LOVE IT!! Thanks so much! Where did you get the quilt in the master bedroom? LOVE! I have been searching for one like this forever. Love the room. Love the home. Love Everything!!! Please go to the original source. Her name is Sonya and I have it linked in the post. Thanks! I love your master bed – four posters are so classic. Where did you find it? This is another bloggers home tour. You can go on over to Sonya’s blog and ask her:) Thank you.